We've reduced the time it normally takes to make this Greek dish by using some of our prepared ingredients: Cook's ingredients Chargrilled Aubergines and Soffritto. Preheat the oven to 220ºC, gas mark 7. Warm a large pan over a high heat. Add the lamb and soffritto to the dry pan and cook, stirring frequently, for 8–10 minutes or until starting to colour slightly and soften. Stir in the tinned chopped tomatoes and season to taste. Keep warm. Tip the aubergines into a sieve over a bowl and leave to drain thoroughly (you will not need the oil in this recipe). Spoon and spread a third of the mince mixture into the base of a 1.5–2 litre ovenproof dish. 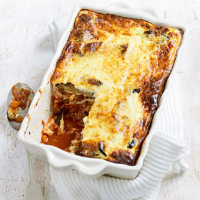 Using about a third of the drained aubergines, cover the mince in a single layer. Repeat this process until finished. Whisk the eggs, the Total Yoghurt and two thirds of the cheese together with some seasoning. Pour over the contents of the baking dish. Sprinkle over the remaining cheese. Bake for 15 minutes or until golden and bubbling.